Clicking the Groups tab within a User Profile will bring User Managers to a window like the following. Only User Managers have the option to visit this screen. All Authenticated Users is a default group that pertains to every user with log-in access to Project Insight. This group is important to note throughout all of the permissions settings windows. The All Authenticated Users group is often used for permissions to general company news and events folders, or system user instructions that may pertain to everyone. Any user can be associated to an unlimited number of groups. Groups are categorized for the purpose of managing permissions to a specific set of users who may span across multiple companies, or could be a sub-set of users within a single company. For example, one frequently recommended group to add to your Project Insight groups is called Administrators. Once the administrators group is added, this group can be given full permissions by default to all new items. Selecting Groups from the Administration section will display a list of the existing groups in the system. A default group named All Authenticated Users is always present. This group can be named differently through the edit process, but it cannot be deleted. The All Authenticated Users group simply refers to all Project Insight Users. Every user added to the system is automatically added to this group. A user cannot be removed from the All Authenticated User group. The All System Administrators Group automatically contains all users with a System Role of System Administrator. It is most frequently used as a base-permission setting in the Edit Folders Navigation so that all users set as System Administrator in their user profile automatically inherit full access permissions to all content. You can add a group by typing in a new name into the blank area and saving it. The only required information in this form is the group name. 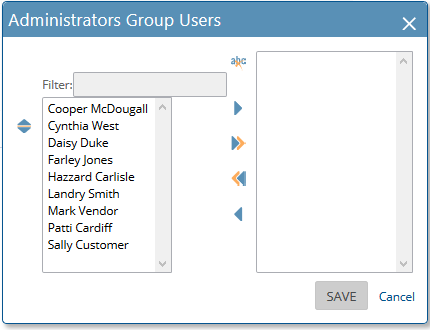 Here in the group administration interface using the icon in the Users column will open a dialog box to choose and add users to the group. In the User profiles, there is a tab for Groups where an individual user can be added to several groups at one time. See Profile. Optional settings for Communications Settings are set using the communications assignments icon in the Admin column as seen in the above interface.